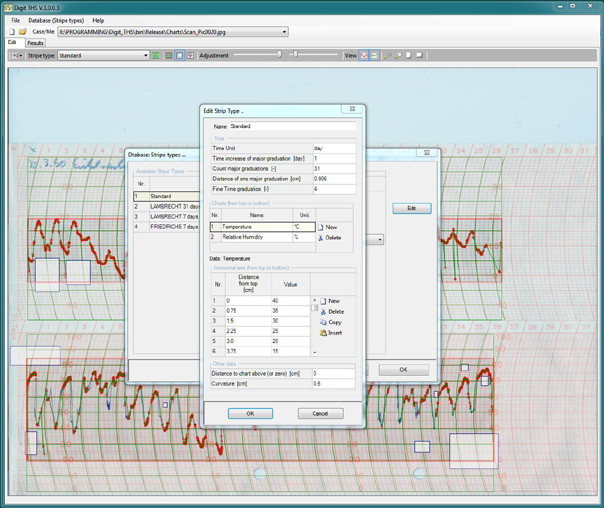 One important achievement of CLIMATE FOR CULTURE is the development of an algorithm to transfer data from thermohygrographs into digital format. This new software contributes to innovation in the cultural heritage sector. In the cultural heritage sector the traditional use of thermohygrographs for recording both temperature and relative humidity is still standard. However, collecting and evaluating the data charts in paper format is usually linked with a large time and staff effort, which not many cultural heritage institutions and owners can afford due to restricted budgets. Against this background a computer programme named DigitChart_ClimateforCulture has been developed by project partner Jan Radon (Engineering Consulting & Software Development, Poland) to convert the measurement results into digital form in order to enhance the evaluation of existing and historic climate data and to obtain comparable data which represents the interior microclimate accurately. DigitChart_ClimateforCulture is now available for testing. If you would like to try out the practicability in your daily conservation work please click here for a free download.